As experienced suppliers of eyelets and rings, we manufacture vented eyelets and rings in high quality brass for a wide range of applications and industries. No matter how large or small your venting application, we have a product for you. Our standard and custom size vented eyelets have a wide range of uses, from providing ventilation in high quality mattresses, dog beds and hats to state-of-the-art microscopes and cutting-edge medical equipment. In fact, our ventilation eyelets can be used for any application you need to let air or gas flow in or out. All Bodill Parker custom and standard size vented eyelets can be supplied in a range of sizes and finishes, solid brass to bright nickel or black oxy plated. Our wide range of affordable vented eyelets are produced and manufactured to BS3102 British quality standards. 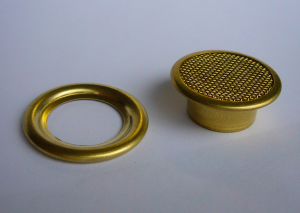 We manufacture and supply both 9.13mm and 5.95 mm brass vented eyelets as standard. Need a custom size or finish? No problem! We’ll tailor make vented eyelets and rings to suit your application, working within your timescale and budget to deliver the bespoke products you need, when you need them. You won’t find eyelet suppliers with more experience, or a higher quality product at a more affordable price. Need to chat about your vented eyelet needs? Get in touch today for a FREE, no-obligation quote.